To override default JPA behavior. To provide the JPA implementation with information that it cannot glean from simply reflecting on the persistent class. In a resource named orm.xml placed in a META-INF directory within a directory in your classpath or within a jar archive containing your persistent classes. Declared in your persistence.xml configuration file. In this case, each XML metadata file must be listed in a mapping-file element whose content is either a path to the given file or a resource location available to the class' class loader. We describe the standard metadata annotations and XML equivalents throughout this chapter. 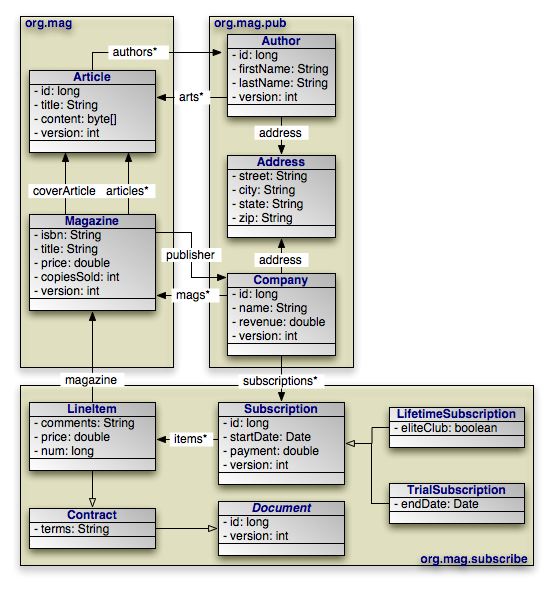 The full schema for XML mapping files is available in Section 3, “ XML Schema ”. JPA also standardizes relational mapping metadata and named query metadata, which we discuss in Chapter 13, Mapping Metadata and Section 1.11, “ Named Queries ” respectively. OpenJPA defines many useful annotations beyond the standard set. See Section 3, “ Additional JPA Metadata ” and Section 4, “ Metadata Extensions ” in the Reference Guide for details. There are currently no XML equivalents for these extension annotations. Persistence metadata may be used to validate the contents of your entities prior to communicating with the database. This differs from mapping meta data which is primarily used for schema generation. For example if you indicate that a relationship is not optional (e.g. @Basic(optional=false)) OpenJPA will validate that the variable in your entity is not null before inserting a row in the database. Through the course of this chapter, we will create the persistent object model above. The following metadata annotations and XML elements apply to persistent class declarations. String name: Name used to refer to the entity in queries. Must not be a reserved literal in JPQL. Defaults to the unqualified name of the entity class. class: The entity class. This attribute is required. name: Named used to refer to the class in queries. See the name property above. access: The access type to use for the class. Must either be FIELD or PROPERTY. For details on access types, see Section 2, “ Field and Property Metadata ”. OpenJPA uses a process called enhancement to modify the bytecode of entities for transparent lazy loading and immediate dirty tracking. See Section 2, “ Enhancement ” in the Reference Guide for details on enhancement. As we discussed in Section 2.1, “ Identity Class ”, entities with multiple identity fields must use an identity class to encapsulate their persistent identity. The IdClass annotation specifies this class. It accepts a single java.lang.Class value. class: Set this required attribute to the name of the identity class. A mapped superclass is a non-entity class that can define persistent state and mapping information for entity subclasses. Mapped superclasses are usually abstract. Unlike true entities, you cannot query a mapped superclass, pass a mapped superclass instance to any EntityManager or Query methods, or declare a persistent relation with a mapped superclass target. You denote a mapped superclass with the MappedSuperclass marker annotation. OpenJPA allows you to query on mapped superclasses. A query on a mapped superclass will return all matching subclass instances. OpenJPA also allows you to declare relations to mapped superclass types; however, you cannot query across these relations. The Embeddable annotation designates an embeddable persistent class. Embeddable instances are stored as part of the record of their owning instance. All embeddable classes must have this annotation. A persistent class can either be an entity or an embeddable class, but not both. OpenJPA allows a persistent class to be both an entity and an embeddable class. Instances of the class will act as entities when persisted explicitly or assigned to non-embedded fields of entities. Instances will act as embedded values when assigned to embedded fields of entities. To signal that a class is both an entity and an embeddable class in OpenJPA, simply add both the @Entity and the @Embeddable annotations to the class. An entity may list its lifecycle event listeners in the EntityListeners annotation. This value of this annotation is an array of the listener Class es for the entity. The equivalent XML element is entity-listeners. For more details on entity listeners, see Section 3, “ Lifecycle Callbacks ”. Here are the class declarations for our persistent object model, annotated with the appropriate persistence metadata. Note that Magazine declares an identity class, and that Document and Address are a mapped superclass and an embeddable class, respectively. LifetimeSubscription and TrialSubscription override the default entity name to supply a shorter alias for use in queries.